Social media management is fundamental for all business owners, but figuring out which tools to use, how, and when can be incredibly challenging. 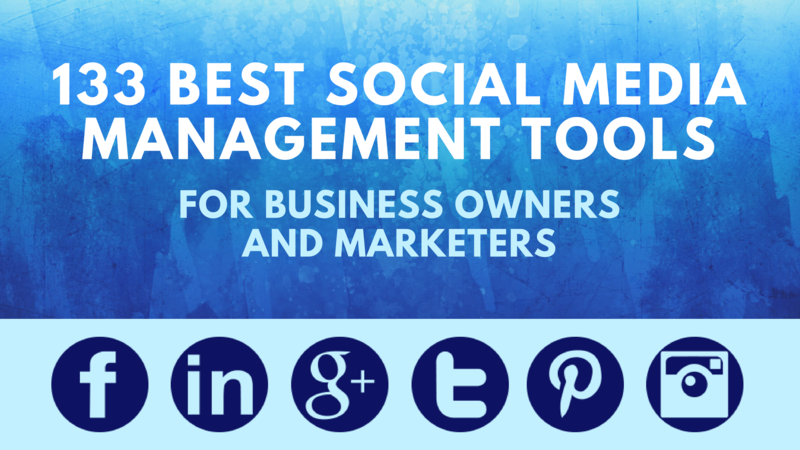 From post scheduling, tracking engagement, and customer relationship management to sourcing and creating images and content generation, here is a comprehensive list of the 133 best social media management tools to choose from. With Spark’s free mobile graphic design app, you can create web stories, social graphics, and animated videos to tell your own story and bring your content to life. Agora Pulse offers social media scheduling and publishing, message management, analytic reporting, competitor analysis, and contest and quiz generation. Price ranges from $29–$199 per month. Formerly SocialBro, Audiense is an all-in-one Twitter management platform with progressive listening, segmentation, insight, and campaign functionality. The price operates on a tiered scale depending on your amount of followers. Bitly is the world’s leading free link management platform that aids in link shortening, performance analytics, and gathering audience intelligence. Brand Embassy, a cloud-based digital customer service platform, helps businesses gain, keep, and grow customer loyalty through customer service management. Price: contact Brand Embassy for a unique plan. Brand24 helps companies discover their online mentions in real time and offers an influencer score and sentiment analysis. They offer a free 14-day trial, and after that price ranges from $49-399 per month. With access to over 80 million sources, Brandwatch is a social media monitoring company that offers social listening and analytics services, from every corner of the web, as they happen. Contact Brandwatch for pricing. Buffer makes it effortless to share any page you’re reading and can ‘automagically’ share them for you during the day. Buffer’s account management and scheduling plans range in price from free to $399 per month. BundlePost focuses on content creation (with a patent-pending tool) and post scheduling and offers a free 30-day trial. After that, prices range from $19.99-$100 per month. Specializing in Facebook, Twitter, and Google+ mentions, BuzzBundle helps you find online conversations about your business or brand to extend your reach to your audience. Free 15-day trial with plans ranging from $199-399 per month. 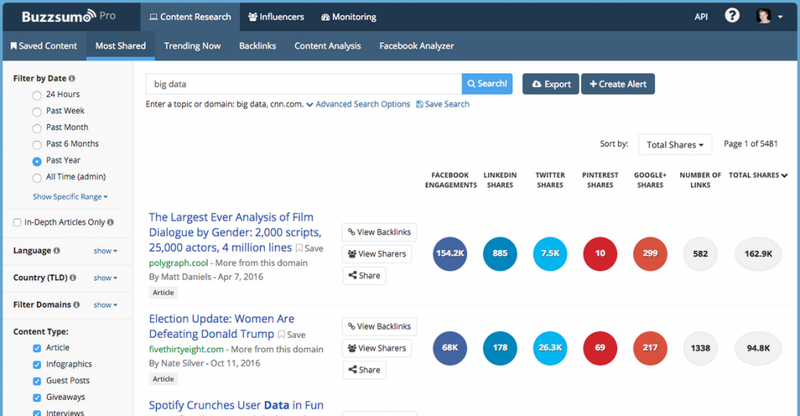 BuzzSumo, when in use with content marketing and SEO campaigns, helps to rapidly pinpoint which content behaves the best for any subject or competitor to better understand the social footprint of a business. Prices range from $79-$559 per month. CalendarX allows you to communicate with your audience through their calendar. Once a customer follows your CalendarX calendar, you can push your relevant events to their personal calendar. You can set up an account for free, and prices range between $7-$72 per month. Whether it’s blog graphics, presentations, Facebook covers, infographics, flyers, posters, invitations, or business cards, Canva’s free design software makes the creation process simple and produces beautiful results. ChattyPeople is currently one of the best customer support bots that integrates seamlessly with Facebook Messenger and comments and is free to get started. Commun.it is a Twitter community management dashboard that easily helps you grow both your following and your brand organically. Pricing: free to get started. One of the leading cloud-based social customer service management tools, Conversocial assists in the management of customer inquiries and discussions on Twitter, Facebook, Instagram, YouTube, and Google+. Pricing: free demo with sign up; contact Conversocial for the cost of a plan. 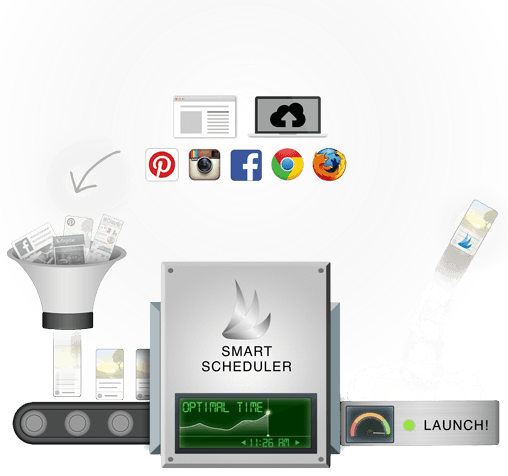 CoSchedule is one of the easiest-to-use marketing calendars and schedulers available. This app keeps all social platforms organized under one roof and offers team collaboration tools. Pricing: free 14-day trial and plans ranging from $30-$1,600 per month. Crowdbooster, a social media analytics tool, measures and develops your social media marketing with accessible analytics and recommendations for both Facebook and Twitter. In fact with Twitter, Crowdbooster can retrieve up to 3,200 tweets from before you first sign up and incorporate them into an analysis. Though currently not accepting new signups, their website assures that more information is coming soon. Cyfe is an all-in-one online business dashboard that tracks web services and social media analytics, sales, support, infrastructure, and more. They offer a ‘Forever Free’ plan with no expiring trials, contracts, or credit cards required. This royalty-free photography service will send beautiful photos to your inbox for free. Premium members additionally receive videos and full access to the photo library. Digimind is an all-inclusive social media monitoring, analtyics, and competitive intelligence tool that offers details on a company or brand’s competitive standing in the market. Digimind offers a free trial but must be contacted for customized long-term pricing. Disqus is an add-on tool for websites and online communities that use a networked platform. You can sign up for Disqus for free with your Twitter, Facebook, or Google+ account or an email address. DrumUp is useful in creating social media content by locating trending and engaging stories of interest to your social media audience, recommending hashtags, adding emoji and GIFs, and scheduling to multiple accounts. Pricing ranges from $15-$159 per month. The free Twitter Engage app outlines your account performance and audience demographics and additionally offers quick insights into analytics during various time periods. Evernote is a free cross-platform app that serves many functions—it can be your task management system, daily journal, digital file cabinet, note-taking tool, and more. Once you make a note, it’s available wherever you go, permanently. Everypost is a social media platform that manages networks like Facebook, Twitter, Google+, LinkedIn, Pinterest, Tumblr, and more. With Evernote, you can create visual content and then share across multiple networks at once. Free for use with one channel, and from $9.99-$99.99 per month depending on the number of both channels and users. based upon social media needs, community size, integration requests, and more. Flipboard is a free news and social media aggregation app that allows you to select your passions and then creates ‘Smart Magazines’ for each of them that are automatically filled with suggested articles. Just as the name suggests, Followerwonk helps you explore and grow your Twitter followers by digging deeper into your Twitter analytics and create actionable visualizations. Versions range from free for one account to $29-$79 per month based on the number of incorporated profiles. This free Chrome cross-promotion and content scheduling extension for Google+ allows you to invite your coworkers and friends to help manage your accounts. Ghost Browser is a free-to-download internet browser designed to help improve the productivity of Social Media Managers, web developers, web designers, QA Testers, etc. by allowing the user to log in to any website with multiple accounts in one browser window. Glean.info (formerly CyberAlert) offers real-time monitoring of more than 60,000 world news outlets, feeds from Facebook, Instagram, Twitter, and LinkedIn, and is available in over 250 languages in 191 countries. Contact Glean.info for pricing and to request a free trial. Easily set up a (free) Google Alert to keep track of your business name or topics of interest, and Google will send you an email when there are new results for your search. Google Trends (free) displays how often a specific search term is entered relative to the entire search-volume across the world and in various languages. Grammarly, a free writing enhancement app and grammar checker (over 250 grammar rules), assists with plagiarism detection, proofreading, and message editing. With Grum, you can post to Instagram directly from your computer, schedule Instagram posts, switch accounts, and utilize suggested hashtags, emoji, and recommended posting times. Grum offers a free three-day trial and ranges from $9.99 per month for 2 Instagram accounts, $3.95 per month for 3-5 accounts, and $2.95 per month for 5 or more accounts. Guestpost.com, which was created by talented guest bloggers and marketers, is a great resource for writers and marketers to plan posts, research ideas, locate editor email addresses, and pitch content. Price: $19.99 per month. One of the most famous social media management tools, Hootsuite allows you to manage campaigns, publish updates, engage with customers, track activity, and analyze results across various social platforms from one web or mobile dashboard. Hootsuite offers a limited free plan as well as packages ranging from $19.99-$499 per month. HowSociable is a free social media monitoring tool that facilitates your learning about the impact of your brand by competition comparison, historical data, and mentions via 36 social media metrics. Pricing ranges from a free version to $9 for 3 months (Basic), $19 for 3 months (Plus), and $99 for one year (Max). HubSpot is an inbound marketing software that can work across an entire team. Share blog posts and landing pages as well as publish directly to Facebook, Twitter, Instagram, and more. Monthly price ranges from $200-$2,400. Iconosquare is an all-in-one Instagram management feature that provides analytics, activity monitoring, content management, publishing, and influencers as well as best practices information and other resources for professional marketers. Plans range from $81-990 per year. IFTTT, which stands for If This Then That, is a free app with which you can create a string of short conditional statements called “applets.” An applet is generated by Gmail, Instagram, Pinterest, or Facebook modifications and might generate an email if a specific Twitter hashtag is used or copy a photo to the archive if the user is tagged in a Facebook photo. Infogr.am is an easy-to-use infographic, online chart, and interactive map generator and has plans ranging from free to $19-$67 per month. Inkybee, a powerful outreach tool, is especially helpful with specific influencer marketing and blogger outreach campaigns and contains a suite of investigative and discovery tools to analyze the various business sectors of particular clients. Pricing: $79-$249 per month. With Intellifluence, brands can unite with popular influencers and receive excellent reviews in 3 steps: 1) using the Influencer Discover tool to find the right influencers to embody their brand, 2) messaging them directly with an offer, and if accepted, 3) they will review the product and share with their personal audience. Intellifluence offers a free 14-day trial and has plans ranging from $39-$129 per month. Keyhole has a real-time dashboard for Facebook, Twitter, and Instagram hashtag and keyword tracking, overall account monitoring, and historical data features. Pricing: free 3-day trial and plans ranging from $132-$799 per month. Klear’s mission is to analyze billions of interactions that happen every day on social networks and to extract their valuable insights. Klear offers a free demo and various free influencer marketing, social media analytics, and reporting tools as well as a basic plan for $249 per month. Klout is a free website and mobile app that ranks an individual user’s social influence. By using its own set of social media analytics, Klout is able to generate an influencer ranking from 1-100 called a “Klout Score” that can help its users to not only see where they stand, but how they can improve within the sphere of social media. Later (previously Latergramme) is a platform for Instagram which helps to create, schedule, and publish posts on the aforementioned network. A popular feature is the ability to visually review your Instagram feed as you plan. One account on Later is free, and other plans range from $9-$49 per month. 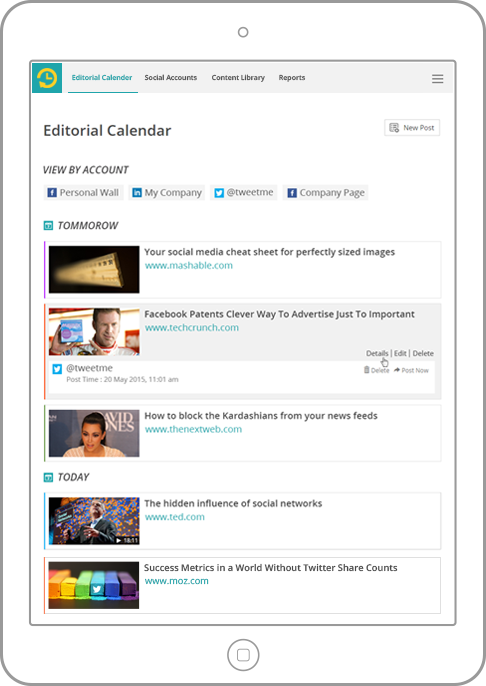 Likeable Hub is another post scheduler that works specifically with Facebook, Twitter, and LinkedIn. Posts can be scheduled, edited, and published directly from the platform. Likeable Hub also offers content suggestions and gives access to the Idea Library (a news feed). Pricing: free demo and $299-$599 per month. Little Bird’s aim is to wipe out the need for influencer research and instead let the user focus on outreach. It allows you to track the most most important people who interact with your business and suggests the most engaging content for you to share. Contact Little Bird to request a free demo and for pricing details. LiveWorld offers a social media software that allows businesses to measure engagement to enhance social customer service and social marketing campaigns. This tool aims to integrate chatbots and human agents with your business’s enterprise system. Contact LiveWorld for a personal quote. One of the more popular email marketing systems, MailChimp helps businesses create attractive email newsletters and supplies email marketing for more than 15 million people globally. It offers a Forever Free program for new businesses and offers plans from $10-$199 per month. With Mavsocial, it’s all about the visuals. Mavsocial focuses on centrally storing, publishing, and managing both videos and images for up to 6 social networks and offers visual analytics on posted content. Plans range from free to $19-$599 per month. Edgar is a social media management system that allows businesses to schedule and publish posts and track and schedule updates. It stores the images and content that you collect in a category-based library and generates a never-ending queue that cycles through your library each week. To learn more about Edgar, sign up on their website for an invitation to join and for pricing details. Meltwater offers instant insights to the editorial footprint and social echo of your white papers, blog posts, and other social releases as well as a free impact report. Contact Meltwater for a free demo and pricing information. Mention is a user-friendly social media monitoring tool that allows businesses to track social mentions, locate influencers, analyze competition, and generate leads. Pricing ranges from $29-$99 per month. Meokay creates chatbots that integrate with Facebook messenger and comments to give audiences the ability to see your advertising messages from within those two locations. The bots can recognize variations on pre-programmed trigger words and phrases. Pricing: free 14-day trial, but contact Meokay directly for pricing. NetBase is an award-winning social analytics platform for primarily large and global companies to manage social media marketing analytics and perform market research. Contact NetBase to request a free demo and inquire about pricing. NewsWhip aims to show businesses what engages their particular audience. It streamlines social media marketing and monitoring to focus on which stories are resonating the most to help build a successful editorial strategy. Contact NewsWhip for pricing and to request a free trial. Nuvi, a social media mining company, specializes in real-time data visualizations that enable businesses to see and hear what their audiences believe, write, say, and feel about various topics. Contact Nuvi for a free demo and pricing. Oktopost is a social media management platform specifically geared towards B2B marketers to publish social messages and engage with social sales. 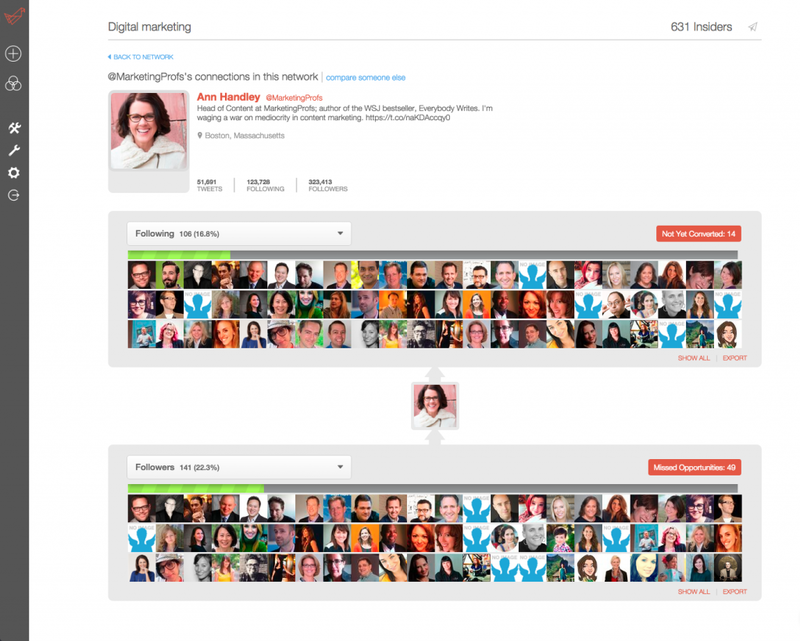 It integrates with LinkedIn, Facebook, Google+, and Twitter. Oktopost’s cloud-based SaaS pricing is determined by the number of marketing teams within the company, social profiles, and other factors. Contact Oktopost directly for a quote. Oraquo’s social listening tools explore, organize, and analyze the web and then create unique reports that can quantify the value of a business’s online audience interactions. Contact Oraquo for a free demo and pricing. Over is a free design app that allows you to create beautiful designs and add text to images for social media sharing. They’ve partnered with UnSplash and Pixabay for free image usage and offer 280 fonts, over 910 illustrations, and they add new content all the time. Pablo is another free design app with an easy-to-use images from UnSplash, or you can upload your own images to edit, resize, and add text and filters. Pagemodo helps you design graphics and other content specifically for Facebook, such as cover photos, post images, custom tabs, and contests. Prices range from $6.25-$33.25 per month. 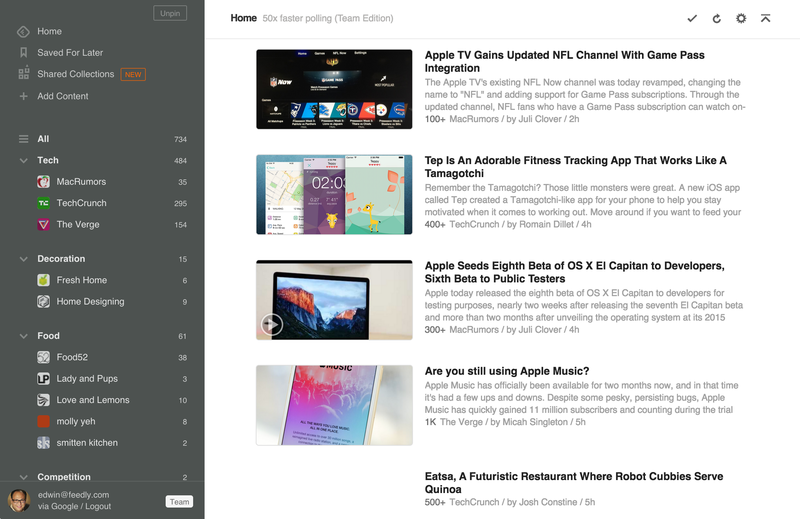 Panda5 is a free newsreader that allows you to browse multiple websites at the same time, research while reading a specific feed, access Dribbble, Twitter, Pocket and Instagram, and personalize your tabs with notes, a clock, and a to-do list. Percolate is a web and mobile software platform that helps to manage all of your marketing in one place. It specializes in marketing calendar organization, briefing management, global-to-local coordination, and social and content marketing. Contact Percolate for a free demo and pricing. PicMonkey offers a basic free service for photo editing and design and collage creation. Pricing runs under $10 per month for the premium plan and under $15 per month for the Supremium plan. 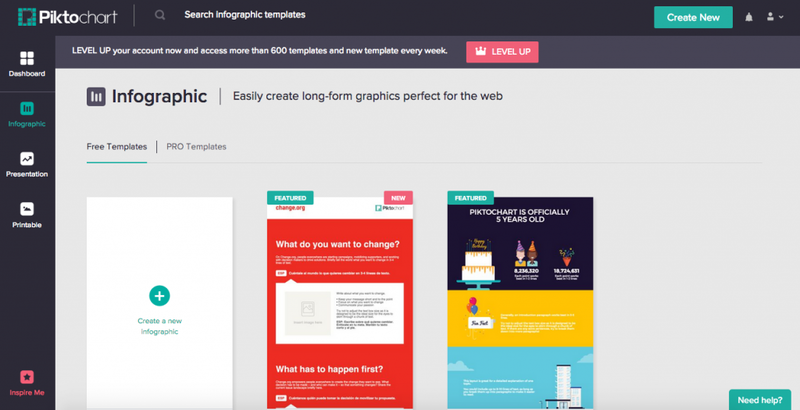 Piktochart is a free and user-friendly infographic generator where you can plug your ideas into templates containing ready-to use images and icons. Upgrading your capabilities beyond the free version ranges from $15-$29 per month. Pixabay offers over 30,000 high quality photos, illustrations, and vector graphics that are free for commercial use with no attribution required. Pocket is great for those occasions where you find interesting content and want to bookmark it for later. You can store articles, videos, images, and other great finds (even without an Internet connection) directly from your browser or in apps like Flipboard and Twitter from your computer, tablet, or phone. Pocket is free and you can sign up with your email address or with Google. Post Planner is a social media engagement app that helps find, plan and post better content from recommended feeds based on your particular industry. Plans range from $9-$49 per month, depending on the number of profiles and planned posts per day. PostReach helps you figure out where your traffic is coming from and who’s talking about your content online by offering analytics geared towards bloggers and content marketers. The blogger plan runs for $10 per month, and the Team plan costs $29 per month. PowerPost curates and creates daily content (up to 1,825 posts per year) and helps to grow a social media audience directly from the paid advertising that is included in its fees. Packages range from $147-$297 per month. With over 100,000 templates available for use, PromoRepublic helps agencies, freelancers, and business owners create stunning social media content. They offer free registration and packages ranging from $15-$37 per month. Proofpoint Social Discover assists in finding fraudulent social media accounts that are identified with your brand. Once these unauthorized accounts are located, you can categorize them and monitor their content for potential risks. Contact Proofpoint for pricing information. With Quickmeme, you can easily caption and share memes for free and check out the ‘What’s Hot’ function to see what memes and gifs are currently trending on the site. What sets Quuu apart in the social media content world is that they claim that every post suggestion has been hand-reviewed in-house. Select your interests, choose how many suggestions you’d like to send to your social profiles, and choose if you prefer the content to be posted manually or auto-posted. Quuu is free to get started and offers premium plans from between $10-$30 per month. Qwaya is a Facebook ad marketing tool that can be utilized with ad scheduling, ad rotation, URL building, conversion tracking, and bidding rules. Prices range from $149-$349 per month. Radian6, also known as SocialStudio, is a part of the Salesforce Marketing Cloud’s social media monitoring platform. This tool boasts a supreme social listening strategy to track industry chat and trends, opportunities, concerns, and competitor activity among other digital management aspects like customer retention and social lead generation. Contact Salesforce for pricing information. Raven Tools offers social media analytics and reporting for LinkedIn, Facebook, and Twitter specifically for social media marketers to generate reports to share with their clients. Raven Tools offers a free trial and has plans ranging from $99-$249 per month. Rebrandly is a URL shortener that stands out because it can create a short link with your custom domain name. Branded links are completely free and the advanced analytics feature is priced at $99 per month. 86) RecurPost: RecurPost helps you schedule your Facebook, Twitter, and LinkedIn posts and then takes your best, most successful content and re-shares it at an optimized frequency to keep your audience engaged. Getting started with RecurPost is free. Refind is a free content discovery tool that can be used on its own or integrated with Pocket, Twitter, or your bookmarks. As you search the web, Refind highlights links that you (or your friends) have saved while searching Google. Reveal aims to figure out the credibility of shared social information, anticipate the subscriber impact, and how these particular factors influence reputation and social significance. News, hot topics, and industry reports/deliverables are all available on Reveal for free. 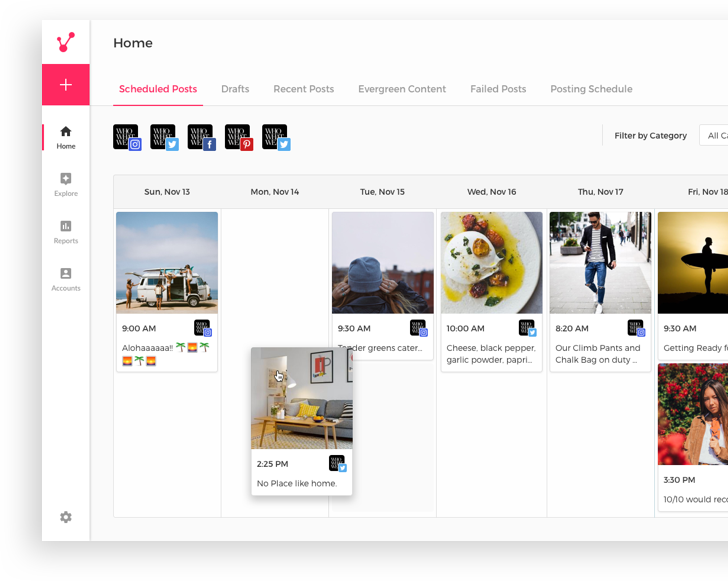 Rignite is a social media marketing software that allows for posting, scheduling, collaborating, responding, and tracking social activity all from one place. Pricing ranges from $28-$49 per month, based on available features. Rival IQ focuses on the analysis and monitoring of your competition, while also providing SEO, content marketing, and additional social reporting services. Pricing ranges from $299-$799 per month. With Rocketium, you can create free high-quality and HD videos simply by uploading images, voice overs, text, and video clips. There is even a team collaboration function for multi-person projects. SE Ranking is specifically designed for agency use in the ranking of websites with backlink checking and monitoring, competitor analysis, and keyword position tracking. Pricing ranges from $5-$139 per month. Sendible is another all-in-one social media management platform that helps manage social platforms, content publishing, message scheduling, and the measurement of ROI. Prices range from $50-$500 per month, depending on the amount of users and provided services. SharedCount is a URL tracking service that monitors shares, likes, and more on Facebook, Google+, Pinterest, LinkedIn, and StumbleUpon. Pricing ranges from $40-$450 per month based on URL API calls per day quotas and URL bulk API batches. Shutterstock offers over 135 million royalty-free photos and vector images for use with social media content. Pricing packs offer a monthly volume of 10 images or 50 images and range in price from $29-$99 per month. Snaplytics (Snapchat analytics) assists with platform management and measures metrics and long-term growth. A free 14-day trial is offered, and plans range from $49-$199 per month. Snapseed is a free photo-editing app that allows users to enhance photos and apply digital filters, and has received app of the year awards from both Apple and PC Magazine. Socedo has the largest source of B2B intent data from Twitter based on real-time behaviors. Marketers can use it to help find new leads or rekindle current leads in their database Tweet keywords, engagements with competitors, or any other entity on Twitter. Contact Socedo for a price quote. Socialbakers offers a social media management suite that combines social media analytics, publishing, and reporting, competitive ad insights and data integration, and predictive intelligence and recommendations. Plans start at $20 per month, but contact Socialbakers for additional pricing information. 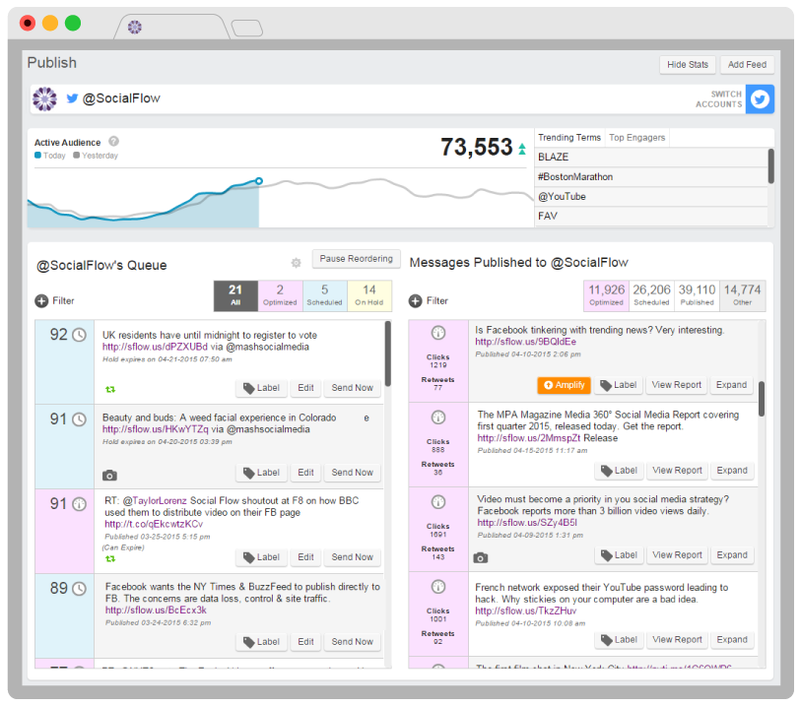 100) Social Flow: Social Flow is a social media optimization platform that helps you to determine what and when to publish both paid and organic social media content. Social Flow uses the Twitter firehose and click data copied from its proprietary link proxy, along with proprietary algorithms, to optimize the delivery of messages on social networks. Contact Social Flow for pricing. Social Metrics Pro is a social plugin for WordPress that aids in social media monitoring, analytics, marketing, and user engagement. The plugin tracks engagement from Pinterest, Twitter, Facebook, and Google+ directly from your WordPress dashboard. Pricing is a $27 one-time fee for a single site, and a $47 one-time fee for unlimited sites. Social Warfare, another WordPress plugin, can help increase social shares and drive traffic to your website or blog by adding attractive and lightweight social share buttons. Social Warfare offers a 45-day free trial and is priced between $29-$250 per year for varying packages. Integrating with Facebook, LinkedIn, Twitter, Pinterest, Tumblr, RSS feeds, blogs, and Plurk, SocialOomph helps its users to schedule content, find relevant people to follow, and monitor general social activity. Pricing ranges from free (with a lot of great features!) to between $6.97-$17.97 per month. SocialPilot, made for agencies and social media professionals, is a social media scheduling tool that helps to save time and increase online efficiency. With the free version, connect up to 3 RSS feeds, up to 5 social media profiles, and make up to 20 posts per day. SocialReport.com aims to simplify the social media reporting process and is another all-in-one management platform. Performance tracking for websites, blogs, Facebook, Twitter, and online reviews is laid out on a simple and intuitive dashboard. Pricing ranges from $49-$199 per month based on the number of projects, brands, and profiles. Sociaoboard is all about lead generation management, with social CRM tools (along with shared customer records) and customer service features (such as helpdesk integration). The individual basic plan is free, and upgraded packages range from $9.99-$99.99 per month. Spredfast’s social marketing software administers social analytics, community management, social care, and content management. The company has received multiple awards, such as an Emmy in the Technology & Engineering category and was named a leader in the Forrester SRP Wave. Contact Spredfast for a demo and pricing. Sprinklr is a customer-first social media management platform that assists global brands with marketing, sales, research, customer care, advertising, and eCommerce on 21 social channels. Contact Sprinklr to request a free demo and for more details on pricing. Another social media management tool, Sprout Social, allows users to integrate with LinkedIn, Facebook, Twitter, Instagram, Google+, Zendesk, Feedly, Google Analytics, and UserVoice and helps to measure social media performance and customer communication. Sprout Social offers a free 30-day trial and offers plans that range from $99-$249 per month. Start A Fire helps track, measure, and get fast insights on 3rd party content and is meant to be fully integrated with existing social media management tools. Contact Start A Fire to request a demo. Synesthesio, which recently acquired Bunkr, is a global social listening platform that listens to what customers and prospects are saying across the web in real-time and then analyzes that data. Contact Synesthesio for a demo and pricing. Sysomos is a unified, insights-driven social platform that gives marketers the ability to search, discover, listen, publish, engage, and analyze at scale across earned, owned, and paid media. Contact Sysomos to request a demo. Tagboard is a resource to search for hashtags across Twitter, Instagram, and Facebook and display those results, from which you can reply, re-share, and generally interact with the person who posted it. Packages range from $500-$2,500. Tailwind is a free scheduling tool for use with Pinterest and Instagram. You can bulk upload images, drag and drop them into a calendar, pin on multiple boards, post, and measure their success with analytics tools. All that’s needed is an Instagram or Pinterest account to sign up. Talkwalker, a social data intelligence platform, stands out because it not only analyzes online and social mentions, but also print, television, and radio content. Pricing ranges from $8,400-$36,000 per year. Trackur is a social media monitoring tools and sentiment analysis software that offers full monitoring of all social media and mainstream news, including Twitter, Facebook, Google+, and more. They offer a free 10-day trial and plans range from $97-$447 per month. Trello is a free visual-based tool for teams to collaborate with one another on multiple projects, prioritize tasks, send files and images, and comment on current projects. Twazzup is a Twitter search tool (free) that you can log into and sync with your Twitter account. Twazzup displays featured tweets, real-time tweets, most popular links, hot topics, and news. Another tool for use with Twitter, Tweepi focuses on growing followers and engaging users on the network. Tweepi’s tools help to search for followers interested in a particular topic and engaging them by mentioning them or engaging in their content. Tweepi offers a free package and other plans ranging from $12.99-$24.99 per month. Tweeps.co is a Twitter app that helps with tweet scheduling (the usual way or from RSS Feeds), saving Twitter searches, and following back Twitter users who follow you with the ability to greet them with a personalized, custom message. Tweeps.co is free – just log in with Twitter. TweetDeck is a free service from Twitter that offers an easier network experience by letting you view multiple timelines on one interface. It includes various features such as managing multiple Twitter accounts, scheduling Tweets for posting at a later time, and building Tweet collections. 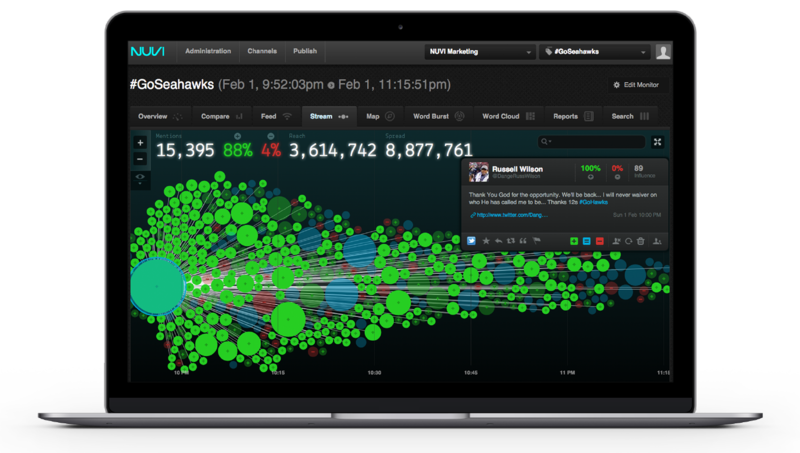 TweetReach focuses on Twitter analytics. Access free reports and monitor in real-time with a free subscription, or opt in for a $99 per month subscription for more in-depth data measurement. Typeform, which boasts ‘Free & Beautifully Human Online Forms,’ helps with building visually appealing online forms, surveys, quizzes, landing pages, and more. The basic plan is free, and the Pro and Pro+ plans range from $29-$59 per month. Waffle is a tool with which businesses can control certain social posts that appear on their website. Sync your social networks to Waffle, select the posts you wish to showcase, and display those posts on your website. Adding one social media account is free, and adding more ranges from $19-$49 per month. Woobox integrates with Facebook for businesses to offer sweepstakes, coupons, giveaways, and more. Sign up for the free version with limited functions, or upgrade to various plans based on your page’s fan base ranging from $30-$500 per month. Word Swag, an app that lets you add text to images for social media sharing, contains 48 fonts, 590,000 images, and 22 filters. The app costs $4.99. Wyng, formerly Offerpop, is a marketing platform to help build and run campaigns that offers a number of templates, eBook and case study resources, and rights management information. Contact Wyng for a free demo. Yala is a chatbot for Facebook and Twitter that uses machine learning to generate the optimal time to schedule social media posts. It analyzes your particular audiences behavior, uses algorithms to figure out the best time to post for each network, and then automatically deploys the post at the right time. The first 30 days are free, and then plans range from $10-$39 per month. Yoast offers help with WordPress website optimization via plugins, SEO services, courses, and eBooks or site-specific website reviews. Yoast’s individual and enterprise pricing starts at $199. 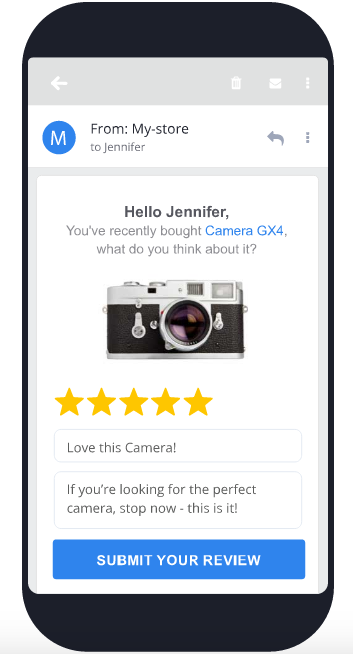 Yotpo specializes in prompting customer reviews by generating an email after purchase. After receiving great reviews, you can then seamlessly share them across your social platforms. Contact Yotpo for a free demo and pricing plans. Zapier connects your apps automatically, so that you can pass information between your apps with workflows called “zaps.” For example, you could create a “Trigger” when you receive a new email in Gmail, which then could automatically copy the attachment from Gmail to Dropbox and then alert you in Slack about the new Dropbox file. There are both Free Forever and Premium plans, which start at $20 per month. Zoho Social is a social media tool that helps to predict the optimal time to post, receive instant notifications of comments and messages, and offers performance reporting. Sign up for the free version, or upgrade to plans ranging from $10-$50 per month.